As Irish professional matchmakers, we often look to the spaces around us for romantic inspiration. Here are fifteen of our favourite romantic spots in Ireland. Millions of us fell for the epic love story at the center of the film, Titanic. Now you can create your own love affair by visiting Titanic Belfast. You can learn all about its original conception and it’s unfortunate tragic ending. If you’re looking to take a romantic stroll, then you should visit the Cliffs of Moher. It is Ireland’s most visited tourist spot, but that doesn’t mean that us locals can’t indulge in it. Take in the majestic views, while falling more in love with your partner. There’s something about live entertainment that gets the heart racing. It creates an immersive experience that both you and your partner can revel in. Though built in 1852, the Cork Opera House has gone through a number of renovations that have turned it into a world-class entertainment space. 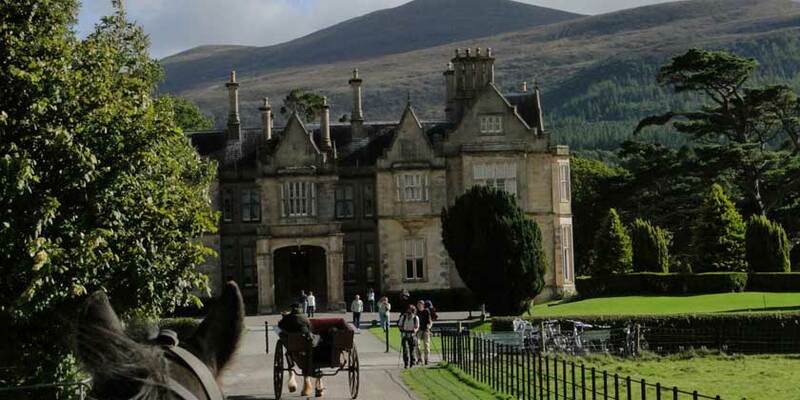 Take a ride on the horse and cart or take to the land by foot, either way you can’t go wrong with a romantic visit to the Muckross House. Also, you can find a secluded spot for just the two of you along the surrounding lakes and trails of Killarney National Park. What’s a better way to celebrate love, but at Giant’s Causeway? It features 40,000 interlocking polygonal basalt columns created from the result of an ancient volcanic eruption. You’ll discover why it’s called the fourth natural wonder of the world. What’s more relaxing than sitting by the fire, sipping some great wine, and getting to know your partner? The Forge Bar offers just this opportunity with two fireplaces located in their relaxed setting. Cozy up to your new mate and see if the fire can heat up the romance between the two of you. King John’s Castle is another one of Ireland’s architectural beauties. It looks out across Limerick’s King Island and due to renovations, now features the opportunity to access its tower. From up there, you can snuggle up and enjoy 360-degree views as far as you can see. For all the animal lovers, we suggest a romantic date at the Dublin Zoo. Not only is this one of the world’s oldest zoos, but it also has over 600 animals. Be sure to take a number of pictures to capture the precise moments that you two fell for one another. The Mussendan Temple is a beautiful piece of architecture, but even more so are the views that it provides. It’s located on a cliff’s edge and provides some of the most magnificent views of the North Coast. If you two fall in love here, it can be booked to host your future wedding. When recently single, you often hear the phrase, “There’s plenty of fish in the sea.” Here’s your opportunity to see it with your own eyes. At the Galway Atlantaquari, you and your date will discover the beauty that lies beneath the sea. If you’re looking for a peaceful location for your next romantic date, then pay a visit to the Iveagh Gardens. You’ll enjoy their amazing gardens, a spectacular waterfall, a working sundial, and even a maze. There’s nothing quite as romantic as a waterfall found in nature. Located at the base of Torc Mountain, you can spend your date embracing this beautiful site. Bring along a simple picnic and let the romance bloom, while surrounded by nature. The Milk Market in Limerick is a perfect romantic spot for foodies or even just people who love to eat. Make your way throughout the vendors, sample their fine goods, and then put together a delicious meal for the two of you. Step into the past to ensure for a romantic future with a visit to this real medieval fortress. You two can participate in their nightly banquet and pretend to be members of the medieval court. You can even get a minstrel to serenade your loved one. Instead of narrowing it down to one romantic spot, we suggest at least an overnight visit to Kinsale. We concur with the many that have described it as one of most beautiful villages in Ireland. You can enjoy the views of River Bandon, down a pint at a pub or enjoy a night of dancing with traditional music. Whether you’re at the start of a relationship or have been together for 50 plus years, there’s always an opportunity to seek romantic inspiration in our surroundings. There are tons of romantic spots in Ireland and we hope that these 15 provide a romantic boost to your relationship.